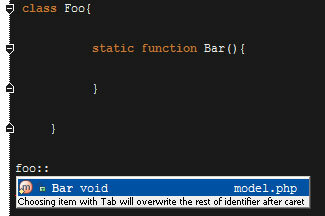 I found it doesn't work with my pre projects, cuz I've been using a lot of static class. For example: self::bar=new db(); self::$bar->(There is no autocomplete). Please post all bug reports to tracker http://youtrack.jetbrains.net/issues/WI Before posting - update to latest EAP build and check that your problem is reproducible. Include complete code example in post.